The McNary Athletic Booster Club is calling for new donations to help pay for an artificial turf field at McNary High School in Keizer just days before a decision must be made whether to move forward. 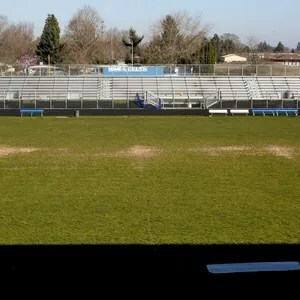 Fifteen months ago parents, community members and district associates formed a committee to raise money for the new turf field at McNary, one of only two schools in the Salem-Keizer School District yet to replace their grass fields. On Monday, June 8, district officials will decide if the committee has raised enough money, signed enough pledges and gained enough momentum to secure the project based on a proposal given by the committee. Should the proposal be approved, construction can break ground the next day and remain on track to open the field on McNary’s annual Blue Day celebration, set for the third Saturday of August. However, if the committee is not able to raise about $117,000 more by then, an amount that would demonstrate the security and sustainability of the project, the district may decide to postpone the ground breaking. This could be devastating to the project, according to project consultant Bill McNutt. The original goal was to raise $500,000 worth of in-kind donations – such as excavation materials – and an additional $500,000 in cash to pay for the actual turf, with the plan to begin excavation and construction at the start of June. But after receiving multiple private donations, going toward in-kind donations and reducing the need for cash donations, the total project cost was lowered from $1 million to $450,000. This effectively eliminated all labor costs. And while the committee has raised a significant amount, totaling $149,000 paid and thousands pledged as of Thursday, they still haven’t reached their goal line. A better field with artificial turf for the McNary Celtics is a long-term solution for a problem that has faced the high school for a while, said Danielle Bethell, president of the McNary Athletic Booster Club. Although $117,000 may seem like a large sum, the long-term benefits are believed to best serve the community. According to McNutt, synthetic turf allows for about 10 times more events per year, because grass cannot regenerate quickly enough to withstand the number of activities desired for the field. In fact, while the grass field can accommodate about 150 activities per year, turf can host about 1,500. The turf also requires far less maintenance, saving the district money and allowing them to bring in increased revenue from outside teams and organizations. McNutt was previously involved in replacing the grass fields at Sprague and West Salem high schools. He said the district will end up saving $25,000 to $30,000 per year, and the turf will last about 10 years. Additionally, the unevenness of grass fields generally pose significant risks to those who use them, something turf helps address. Although the turf will directly affect McNary High School, many other members of the community will benefit from it as well, Bethell said. Lacrosse, track and field, marching band, soccer, cheerleading, Pop Warner and Boys & Girls Club activities are some of the groups that will use the turf. Bethell said there are multiple ways to donate, and stressed that every donation is important, no matter the amount. People can donate by delivering a check to McNary, giving to the project’s GoFundMe account, or by calling or sending an email to a committee member such as Danielle Bethell, president of the McNary Athletic Booster Club or project consultant Bill McNutt. The Keizer Chamber Team, part of the Keizer Chamber of Commerce, is dedicating the funds raised at an upcoming Luncheon Forum on June 10 for two causes, one being the McNary Turf Field, if donors would like to contribute that way. Donations can be dropped off at McNary High School at 595 Chemawa Road N, Keizer. For more information, contact Bethell at (503) 851-8617 or McNutt at wmcnutt@farmersagent.com or (503) 581-4479.